The historical toys and games shown below can be used by reenactors for living history or by museums, schools and other institutions for history displays and other educational purposes. They can also be a good way to keep you children busy at reenactments. The domino game dates from the renaissance, while some of these toys and games, including the chess set, date to the American Colonial period. The rest date to the Victorian period, including the American Civil War, Indian Wars and Old West. Some were popular parlor games. Cloth Ball: These tough balls are made from canvas. They're about the size of a softball and can be used for countless games. Many kids could be kept busy for hours with just one of these balls and a stick for a bat. At least 1860s on. Leather Ball: This is the ball that comes with Knurr and Spell. It is made in the old "lemon peel" sewn style. Knurr and Spell: Long before baseball became the official American past time, a variety of ball and bat games were popular. Knurr and Spell is a distance game. The object of the game was to hit the ball as far as possible toward a measured target. The spell is a small hard ball that was shot into the air when the Spell was hit with a stick or bat. Our Spell and 17'' long bat are both made of native pine and are based on period artwork. 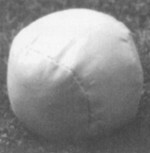 For safety we have replaced the small hard Knurr (ball) of the original game with a small leather covered "lemon peel" style sewn ball. Battledore & Shuttlecock( or Jeu de Volantis ): is an outdoor game played since the earliest American Settlements. It is an ancestor to both modern badminton and table tennis. 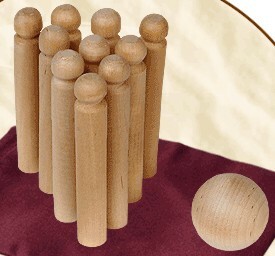 This game is played by two persons with small rackets, called battledores, made of parchment or rows of gut stretched across wooden frames, and shuttlecocks, made of a base of some light material, like cork, with trimmed feathers fixed round the top. The object of the players is to bat the shuttlecock from one to the other as many times as possible without allowing it to fall to the ground. Games with a shuttlecock are believed to have originated in ancient Greece about 2000 years ago. Check, by clicking, the box for each item and size wanted. Update the quantity if you want more than 1. When done selecting any/all items, click the "Put these items in my cart!" button. The toys of the cup and ball family have been favorite childhood amusements for many centuries, unchanging in their basic form but marvelously various in the specific designs. The object of the cup & ball game is to swing the wooden ball into the cup, which is not at all as simple as it appears to be. These toys were quite popular in Europe with adults and children alike throughout the time of the settlement of the New World colonies and would have been favorites on the North American continent as well, where they continue to be greatly enjoyed to this day. 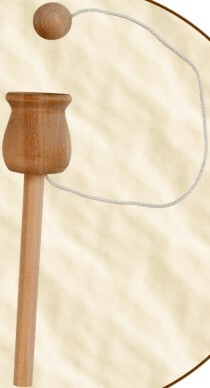 Bilbo Catcher (Bilboquette): The Bilbo Catcher has a solid wood spindle 4 7/8" long, with a solid wood ball. In the Bilbo Catcher one side of the spindle is a straightforward cup and ball game, while on the other side the player must catch the ball on the tip of the spindle by a hole drilled in the ball for that purpose. Each toy is packaged in a poly bag with a history and instruction sheet. Cup and Ball, Large: The large cup and ball toy is a solid wood turning 10 5/8" in length, with the cup designed in line with the handle. The ball is solid wood 1" in diameter. Each toy is individually packaged in a poly bag with a history and instruction sheet. Cup and Ball, Small: The small cup and ball toy is also solid wood turning 6" in length, with the cup designed in line with the handle. The ball is solid wood ." in diameter. It is available in either natural wood or with a painted (yellow cup and red ball). Each toy is individually packaged in a poly bag by Historical Folk Toys. Historical Background: Toss toys date back to ancient Greece. 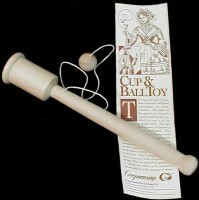 The Cup and Ball Toss Toy was played with in Colonial America and is mentioned in an 1834 publication for girls. 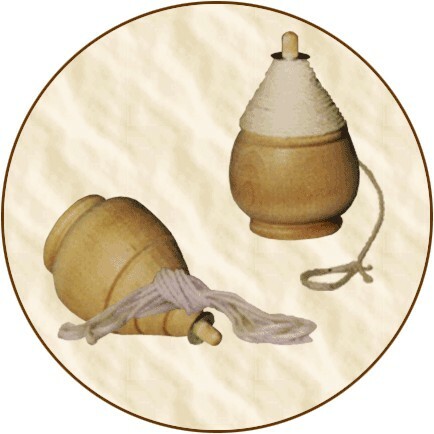 It is similar to, but much easier than the Bilboquet, which has the ball landing on a pointed stick instead of inside a cup. See if you can catch the ball with the cup. Play with others and see who can score the majority of points by catching the ball the most. Do not let this toy fool you; it takes good hand dexterity to score. This simple toy is one of the most popular in our Classic Toys & Puzzles collection. 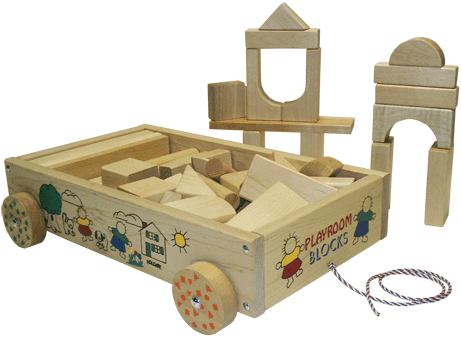 Wooden Building Blocks: Our exclusive Block Sets create hours of fun. From stacking a castle tower, to building a bridge, or making a playhouse; block play enhances imagination, spatial concepts, and problem solving. Best of all, blocks accommodate increasing abilities and changing interests through the formative years. All the hardwood blocks are sanded smooth with rounded edges and a natural finish. This collectible toy has a lifetime guarantee. The folks at Holgate pledge that their products are made of 100% natural kiln dried hardwoods, non toxic paints, and quality engineered. Their products will not warp, split or splinter. A history of excellence is behind every toy they make and sell. 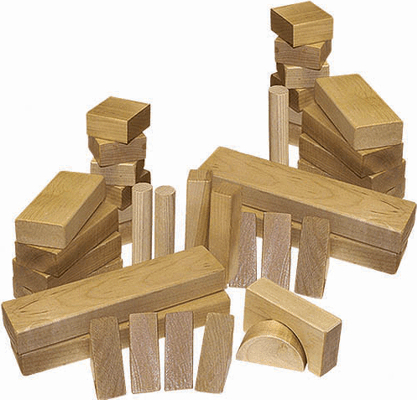 28 Piece Set: Contains 28 wooden blocks in various shapes and sizes. 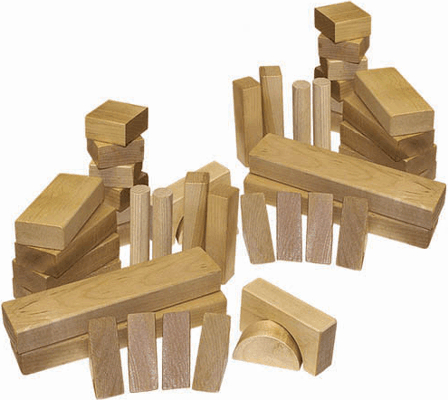 48 Piece Set: Contains 48 wooden blocks in various shapes and sizes. 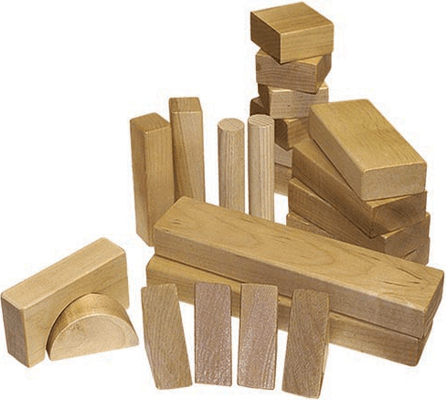 62 Piece Set: Contains 62 wooden blocks in various shapes and sizes. Wagon of Blocks: Sturdy wagon holds and stores 48 blocks in 11 different shapes. Great for larger and more advanced projects. Wagon measures: 18-1/2" long x 12" wide x 4-1/2" high. (these are the ones in the pictures in the 6 block high stacks). 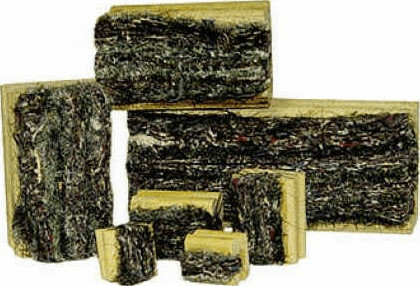 Largest Block is 2-1/4" x 1-1/8" x 9". Ages 2 years and up. These are the chalk / slate boards that the children used in school during the 18th (1700s), 19th (1800s) and into the early 20th (1900s) centuries. They were their scratch paper. They used them to practice their Reading, Writing and Arithmetic. There was no waste, as they could be erased and written on again and again. Of course they were messy, because of the chalk. They didn't eliminate the quill pen or stylus, as those were used also. So there was still the opportunity to dip the hair of the girl sitting in front of you into the ink well. Oh what fun, even if it meant sitting in the corner for awhile. Slate Chalk Boards and Chalk Boards have an unfinished wood frame around the chalk board (piece of slate or imitation slate). The 7" X10" is the most typical size used in school rooms. Slate Chalk Boards have a piece of slate for the writing surface and therefore both sides are the same and can be used. 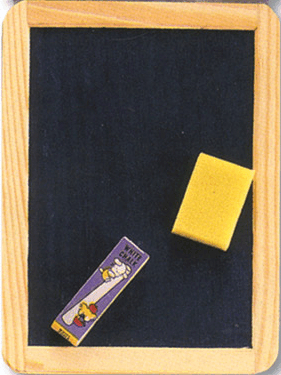 The (real slate) boards are the typical chalk boards used by school children during the 19th century. Slate is somewhat fragile and can be broken if dropped or otherwise mistreated. 7" x 10" Slate Chalk Board (in 8 1/2" x 11 3/4" frame) has an unfinished wood frame around the Real Slate chalk board. Real Slate is writeable on both sides. 6" x 8" Slate Chalk Board (in 7 3/4" x 9 3/4" frame). Same as the 7" x 10" Slate Board, except in the smaller size. 5" x 7" Slate Chalk Board (in 6 3/4" x 8 5/8" frame). Same as the 7" x 10" Slate Board, except in the smaller size. 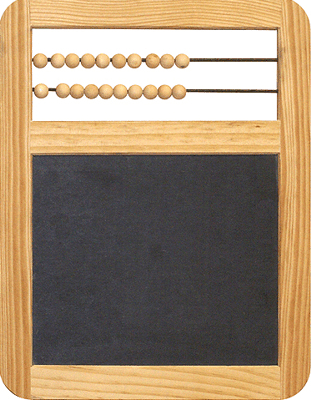 Abacus Slate Chalk Board 7" X 10". It has a real slate section and an abacus, all in one slate board. 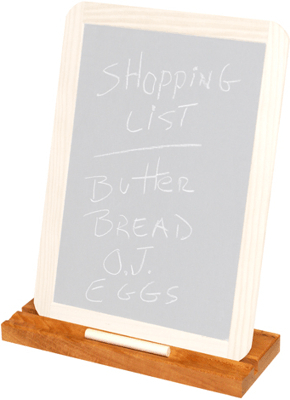 All the imitation slate chalk boards are only writeable on one side. The other side is waffle pressed boards. 7" x 10" Chalk Board (NOT Slate) (in 8 1/2" x 11 3/4" frame). This chalk board also has an unfinished wood frame around the chalk board. It is imitation slate on ONE SIDE ONLY and the other is waffled pressed-board. It is not an authentic reproduction, but a reasonable substitute for those wanting a less expensive or less fragile alternative. 6" x 8" Chalk Board (NOT Slate) (in 7 3/4" x 9 3/4" frame). Same as the 7" x 10" Chalk Board, except in the smaller size. 5" x 7" Chalk Board (NOT Slate) (in 6 3/4" x 8 5/8" frame). Same as the 7" x 10" Chalk Board, except in the smaller size. Chalk, White. Box of 12 pieces of white chalk. Fragile, may arrive with some broken pieces. Wood Stand with groove cut in it to hold up a chalk board. Most students probably did not have erasers and just used a small rag to wipe the board clean. At some point you would need to dampen the rag to get the board really clean. Penny Doll: Discontinued / All Out. 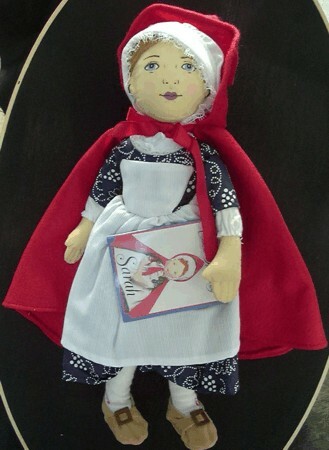 This 6" doll is made of wood and was a common plaything for Early American girls. We've found that 20th century American girls like them too! Penny Doll Kit: Discontinued / Some Left. This is the Penny Doll plus some material and pattern to make her some clothes! Corn Husk Doll Kit (Early American): The Early American Cornhusk Doll Kit includes real corn husks, string, fabric to make an apron and scarf, pattern, instructions, and history. This is a great kit for school projects. This doll also makes a nice centerpiece for a Thanksgiving table or mantle decoration and looks pretty in a large wreath. 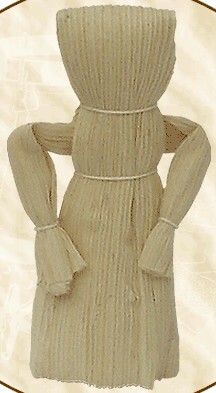 Cornhusk dolls can be made with or without the fabric additions. Size varies due to the length of the cornhusks. Corn Husk Doll Kit (Traditional): Our Traditional Cornhusk Doll Kit includes real cornhusks, string, instructions, and history. This is the simplest of all cornhusk dolls and can be taught to the very young. The early settlers learned to make cornhusk dolls from Native Americans. String two or three of these dolls together with small pine cones for a pretty garland to hang during celebration times. Size varies due to the length of the cornhusks. 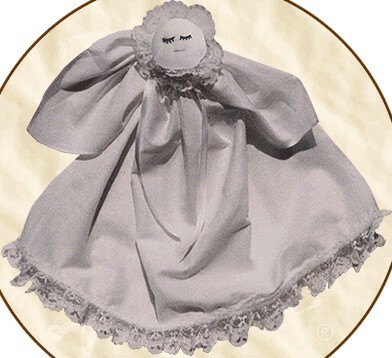 Handkerchief Doll Kit: Our Handkerchief Doll Kit includes one 15-inch square white handkerchief, ribbon, lace, needle, embroidery floss, stuffing, instructions, and history. 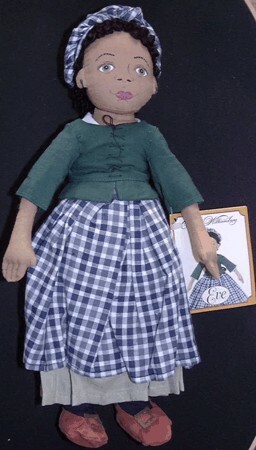 This historical doll has been used for centuries to keep little girls quiet during church services and can be very easily made. Everything you need is included in the kit. Miss Poppet Doll Kit: Our Miss Poppet Doll Kit includes fabric, string, yarn, stuffing, embroidery floss, sewing needle, pattern, instructions, and history. You only need to supply a pair of scissors and some time to make this historical doll. Miss Poppet is based on a similar surviving rag doll that is over 120 years old. You can choose to make the doll as it is shown or as a replica doll without arms, hair, and bonnet. Finished size is approximately 13 inches tall. 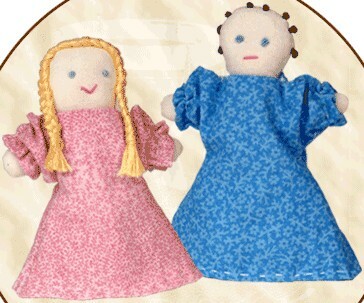 Pocket Folk Doll Kit: Our Pocket Folk Doll Kit includes muslin for two doll bodies, two different fabrics for the dresses, sewing needle, embroidery floss, stuffing for the bodies, instructions, and history. These sweet dolls are fun to make and perfect for two young hands! The dolls measure 3-1/4 inches tall when finished. 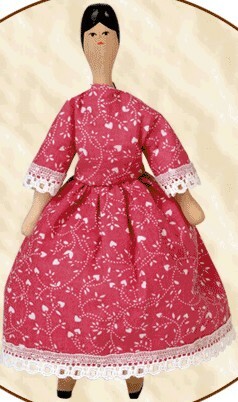 This kit could serve as a sewing project for a young girl, a new mother, any crafter, or a folk doll collector. Each doll will be unique and can be played with as a toy, worn on a coat, set in a wreath, or placed on a mantle for decoration. Whatever their ultimate use, they may be a prized possession in the future. 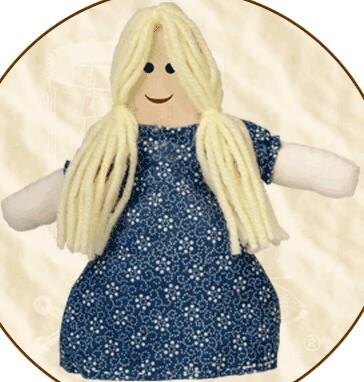 Spoon Doll Kit: Our Spoon Doll Kit includes a 4-inch wooden spoon, fabric for dress and arms, needle, floss for sewing, yarn for hair, stuffing, instructions, and history. This is a popular American colonial doll craft for girls of all ages. This kit is also a nice project for colonial museum workshops, Girl Scout groups, elementary school classrooms, or for a parent-child activity. The cute little doll also looks great in a seasonal wreath or as part of a table decoration. 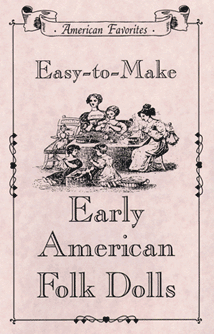 Easy-to-Make Early American Folk Dolls (Book): Our Easy-to-Make Early American Folk Dolls Book includes patterns, instructions, and histories for the following 12 dolls: Old-Fashioned Rag Doll, Traditional Handkerchief Doll (or Church Doll), Revolutionary War Knot Doll, Aunt Judith's Yarn Doll, Nineteenth-Century Felt Doll, Pioneer Leavings Doll, Classic Cornhusk Doll, Primitive Corncob Doll, Miniature Cloth Doll, Colonial Spoon Doll, Tied Handkerchief Doll, and Early American Poppet Doll. This collection is filled with nostalgic line drawings and interesting fun facts. Actual book size is 5-1/2 inches by 8-1/2 inches and contains 32 pages. 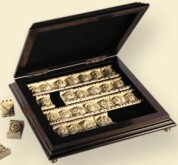 Dutch Renaissance Domino Game: reproduction of a set crafted by a gifted Dutch renaissance artist over three centuries ago. Presented in a beautiful brass legged wood box. Rich in history, fun to play parlor game (parlour game). An unsurpassed gift for the discerning. Size: 23cm x 24cm x 5cm, 9" x 9.5" x 2". Wooden Dominoes Game: Our Wooden Dominoes set contains 28 double-six wooden dominoes, rules for play, and comes packaged in a wooden storage box with sliding lid. The storage box measures 6-3/4 inches by 1-1/2 inches by 2-1/4 inches. By Historical Folk Toys. Historical Background: The Inuit game of "Á ma zú a lát" is similar to the game of dominoes. The Eskimo name for dominoes means "standing upright side by side." The European game of dominoes seems to have been borrowed from the Chinese, but only the math elements were retained. Dominoes have had shapes other than the flat, small pieces we now know. 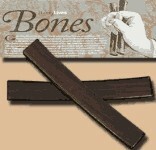 In Korea, dominoes were long, cube-shaped, bone-faced bamboo pieces. In India, "pase" dice-looking dominoes are long rectangular, cubed dice with pointed ends and are made of bone or ivory prisms, marked on four sides. 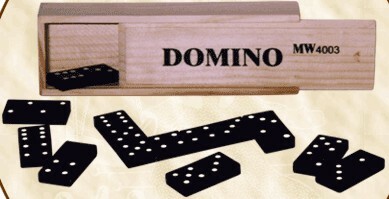 Dominoes may have originally been used as counters in dice games or in a method of fortune telling with dice. In the year 1120 A.D., the dominoes we know today existed in China and it is believed that dominoes descended from dice around this time. The game of dominoes was a popular game during Colonial American times and continues to be a favorite American game. Dominoes are as popular with adults as they are with children. Many Irish pubs feature domino games and sponsor domino contests. The drummer was an integral part of military life during the 18th century and maintained a reduced but still important role into the mid-nineteenth century. A fifer and drummer, usually between the ages of 12 to 16, were attached to each Company in a regiment. In camp drummers sounded out the routine calls to duty. In the field, they signaled the commands of the officers. When the Companies of men were assembled, the musicians were massed to from a corps of fifers and drummers, which provided military music for parades, reviews and special ceremonies. Individually the musicians could be called upon to perform both formal and informal music for dancing and entertainment. 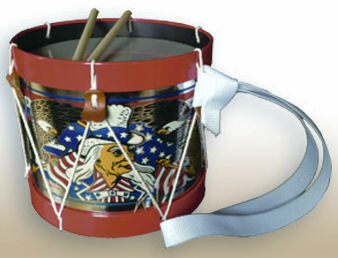 Youth / Child's Rope Tension Drum, by Cooperman's Fife and Drum: This is a downsized musical instrument rather than a toy. Dimensioned for a child's use, the drum is 10" in diameter and stands about 12" tall. The solid hardwood shell and hoops are cut and steam-bent at Cooperman's Vermont sawmill, much as they would have been in early America. 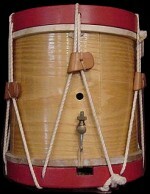 The sounding surfaces, known as "heads", are made of natural vellum (animal-hide) and the distinctive sound of the snare drum is provided by natural gut snares stretched across the bottom of the drum. 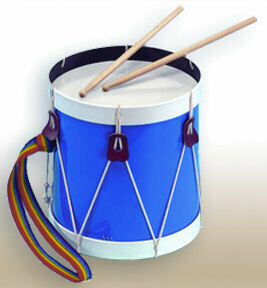 Child's Toy Drums: These are Toy Drums and NOT musical instruments, like the Cooperman Youth Drum. Silver Rope Tension: Noble and Cooley Americana toy field drum is a replica (not necessarily a reproduction) "cord and ear" rope tension drum. Size approximately 9" diameter and 10" high. Comes with sling and drum sticks. Blue Rope Tension: Noble and Cooley Americana toy field drum is a replica (not necessarily a reproduction) "cord and ear" rope tension drum. Size approximately 10" diameter and 10 1/2" high. Comes with sling and drum sticks. Star and Shield: Noble and Cooley toy field drum using spring clamps for tension. It is based on the original lithographs from the 1880s. Metal shell embossed on the original machine with the same colors. This a much later period of tension than the rope tension drums. Size approximately 9" diameter and 7 5/8" high. Comes with sling and drum sticks. 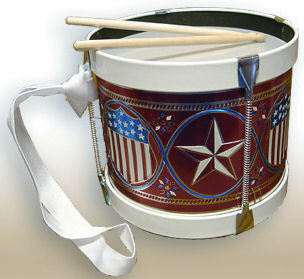 Collectible Patriotic: Noble and Cooley toy field drum using spring clamps for tension. It is based on the original lithographs from the 1906 with Uncle Sam surrounded by Eagles and Stars and Stripes. Metal shell embossed on the original machine with the same colors. This a much later period of tension than the rope tension drums. Size approximately 8 1/2" diameter and 7 3/4" high. Comes with sling and drum sticks. Youth / Child's / Toy Drumsticks: Our toy drum sticks are a scale version of the snare drum sticks in use today by rudimental drummers who carry on these fife and drum traditions. 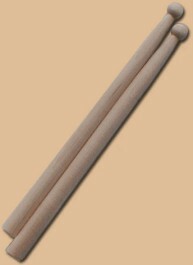 These solid wood drum sticks are about 10 3/8" to 10 12" long and each pair is individually packaged in a poly bag with a history card. Complete Music for Fife and Drum by Walter D. Sweet: A collection of 78 tunes containing some Civil War selections as well as many other traditional favorites. Each arrangement features harmony, style marks and guitar chords. The music is supplemented with histories of the tunes and drumbeats. 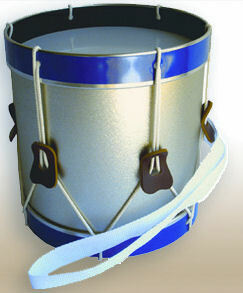 Complete Music for Fife and Drum was compiled by a professional fifer and is intended for the military fife in B-flat. This book offers tunes from the Revolutionary and Civil War eras with suggested snare and bass drum parts as well as chord progressions. It also contains a wealth of fife history and resources. Opponents send gaily beribboned hoops whirling towards each other to be caught on the tips of slender wands in this exciting and elegant sport. 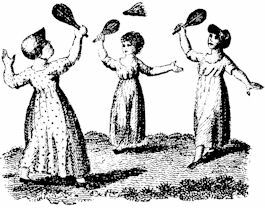 The game of Graces was considered both proper and beneficial exercise for young ladies in the early 1800's and it was proper as well for boys to join in as a "lark". Also known as Les Graces or the Flying Circle, the game of Graces was described as early as 1831 in "The American Girls Book" and judging by children's books and store advertisements, remained as popular throughout the 19th century. We have two different sizes of the Game of Graces. Large: has two 10" diameter solid wood grace hoops, packaged with 4 tapered 22" solid wood wands and 8 lengths of colored ribbon in a poly bag, with history and instructions. The larger hoop are easier for younger children to catch. 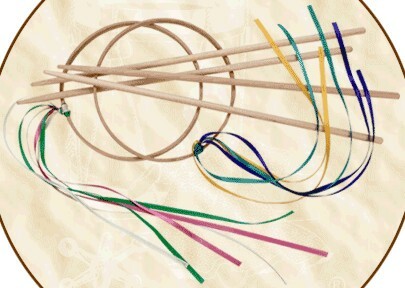 Small: has two 7" diameter solid wood grace hoops are packaged with 4 tapered 19" solid wood wands and 8 lengths of colored ribbon in a poly bag, with history and instructions. The smaller hoops make for a more challenging game. By Historical Folk Toys. Historical Background: The historical game of Graces is meant to be played outdoors by two people. It was brought to America by the French where it was known as La Grace. Also known as The Flying Circle and French Hoops, it was most popular during the Victorian period, particularly with young ladies, and used for exercise and to teach gracefulness. Young men never played this game together but were willing to play with a lady. Times have changed and we now encourage everyone to play this game, young and old, boys and girls, men and women. Hopscotch has been a favorite game of children for centuries. It is played by marking squares on the ground and leaping into designated squares in a particular sequence. The name comes from the 17th century term escocher, meaning to cut or cut with a stick. This was the way children originally marked the playing surface (usually packed earth). It also may broadly relate to the term to the phrase to "scotch" something, as in scotching a rumor, meaning to put an end to a rumor. The game is played by scratching or marking a series of squares on the ground, sometimes single squares and sometimes two squares side by side, on which the children would jump. As a child progressed satisfactorily through the series of squares, a pebble would be tossed into the next square to mark the beginning square into which the child was to make their first jump. The remaining rules vary widely, but the object is to make the necessary leaps and maintain your balance as your progress through the series of squares. Out of hopscotch, oddly enough, some elements of history have survived thanks to the chanted "calls" passed down from mother to daughter over long periods of time. Perhaps most notable and relevant to the antebellum and Civil War period is the chant which is known today as "The Pateroller Song" ("pateroller" is a term derived from the word "patrollers", a reference to the men who patrolled the highways and byways in search of runaway slaves), a song which slaves began long before the War Between the States began, and one that continues to this day through the hopscotch and jump-rope chant. Hopscotch Game: Our Hopscotch game comes with sidewalk chalk, 5 pucks and directions for traditional hopscotch games by Historical Folk Toys. Historical Background: According to most sources, hopscotch was developed centuries ago in Great Britain during the Roman occupation. Because the original hopscotch courts were used for military training, they were over 100 feet long! These long courts represented the long 400-mile journey on the Great North Road connecting London, England, to Glasgow, Scotland. Roman soldiers used this road frequently, so a military exercise was developed to condition them for it. Roman soldiers tested their strength on these hopscotch courts by carrying heavy loads or wearing full armor. Today, football players go through similar conditioning drills by running through rows of truck tires in full gear. It is reported that Roman children made their own smaller courts to imitate the soldiers. The children developed a scoring system for their games, and hopscotch was born and spread throughout Europe. The word "hop scotch" literally came from hopping the long road to Glasgow, Scotland. Various cultures have developed their own games with different courts and rules. Other words for hopscotch are: "marelles" (France), "templehupfen" (Germany), "hinkelbaan" (The Netherlands), "ekaria dukaria" (India), "pico" (Vietnam), and "rayuela" (Argentina). Most hopscotch games are played with a "puck" or "potsey." The puck can be a stone, rock, a piece of flat glass, crockery, or just about anything that can be thrown onto the courts. The courts can be drawn with chalk on a concrete surface or with a stick on a bare spot of level ground. Generally, hopscotch games are played by tossing the puck into a drawn section and hopping in a specific way through the court and back. There are rules against stepping on a line, missing a square, or losing your balance and touching the court with a hand. The first person to complete the course is the winner. Today, we think of Hopscotch as a children's game, particularly for girls. The game of Hopscotch is featured in "The Boy's Own Book" by William Clark, first published in 1829. This book was considered "A popular encyclopedia of the sports and pastimes of youth." Interestingly, the game of hopscotch is not featured in "The Girl's Own Book" by L. Maria Child, published in 1834. Hopscotch was considered a boy's game, as depicted by five boys playing the game in the illustration "Scotch Hoppers" from "Juvenile Games for the Four Seasons." Game of Jacks: The game we know as jacks was played in the ancient world over two thousand years ago with small animal bones or pebbles. In early America the game was known as five-stones or jack-stones. As time went on, one of the stones (The Jack) was replaced by a wooden ball, then rubber ball. The other stones were replaced by small pointed metal pieces reminiscent of the original animal knucklebones. 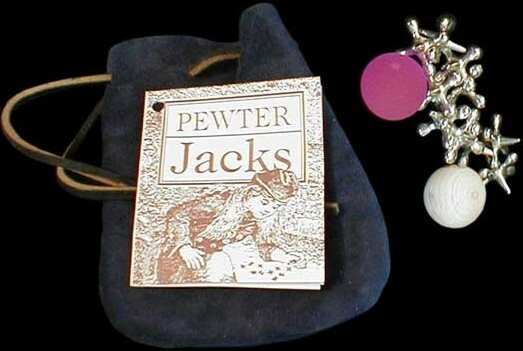 We have cast 10 jacks in lead-free pewter and packaged them with 1 wooden ball and 1 rubber ball in a cloth pouch. It comes with a hang tag that provides a history of the game and rules for play. The pouch comes in a variety of colors. Game of Knucklebones: Knucklebones was similar to today's game of Jacks. 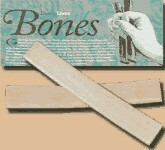 The bones could also be used for game of chance, by marking the flat surface with numbers from 1 to 4. We have packaged 5 synthetic knucklebones, closely resembling the original animal bones, in a poly bag along with one wooden ball, and a history and instruction sheet. Historical Background: Jacks, in its original form, was played in ancient Greece, Rome, and Egypt. This game was also known as Jackstones, Five Stones, Knucklebones, and other names. Knucklebones eventually led to the game of dice (which was mostly played by boys) and to the game of jacks (which was mostly played by girls). Jacks is a game of skill, as are earlier games that involve throwing the jacks into the air and catching them, or bouncing a ball and picking up a certain number of jacks from a surface. Children all over the world have played some form of jacks for centuries. The mysterious movement of this puzzling toy has fascinated generations of American children. Described in Scientific American (1889) as a "simple toy - very illusive in action", the Jacob's Ladder still confounds us with its seemingly inexplicable motion. Our Jacob's Ladder is constructed of 6 solid wood segments attached with colorful grosgrain ribbon. Each toy is individually packaged with instructions for some tricks to add to the mystery by Historical Folk Toys. Among the Puritans and Separatists and indeed among the Protestant sects up through the mid- to late nineteenth century, few toys were acceptable for amusement on the Sabbath, as the Sabbath was set aside for the exclusive purpose of worshipping God and reflecting upon His grace and mercies on that one day in seven. Most Protestant denominations were Sabbatarian then. The "Sunday Blue Laws" that were in place in most states even into the end of the 1960's throughout the country bear witness to the prevalence of that formerly-held conviction. "Jacob's Ladder" was one of the toys acceptable for use on the Sabbath. Its construction was somewhat along the lines of a ladder, reminiscent then of Jacob's ladder from the Old Testament. Historical Background: The Jacob's Ladder toy dates back to Pilgrim times in the New World and was allowed as a Sunday toy for Puritan children because of its biblical reference (Genesis 28:12). Jacob was on a journey and had a dream about angels moving up and down a ladder between heaven and earth. Other Sunday toys included the Handkerchief Doll (church doll), Noah's Ark, Whirlygig, Pillars of Solomon, Wolf in Sheep's Clothing, and the Buzz Saw. The Jacob's Ladder toy is still enjoyed today by both children and adults (as a "nice quiet toy"). Marble games have been played in all parts of the world with all kinds of playing pieces for more than two thousand years. Children in colonial America played with marbles made of stone or clay, while glass marbles were highly prized among children's playthings in the 19th century. Enclosure games, hole games and conquering games are all traditional marble games that are still familiar today. Glass Marbles: This game of Marbles contains traditional glass target marbles (30) and shooters (2) of assorted crystal rainbow and cats-eye colors. Each marble game is packaged in a cloth pouch, with a hang tag that provides a history of marbles and instructions and rules of play. Clay Marbles: Our clay marbles are made to represent those that are so often found in historic area excavations. These old style marbles are not perfectly round nor are they totally consistent in size and so are perfect imitations of the original handmade clay marbles. Our Game of Clay Marbles contains 10 target marbles and 2 shooters, all made of red-brown non-toxic clay. Each marble game is packaged in a cloth pouch, with a hang tag that provides a history of marbles and instructions and rules of play. Historical Background: The history of marbles dates back to at least 3,000 years ago in ancient Egypt and Rome. The Roman poet Ovid wrote of the game of marbles. The oldest marbles found so far were buried with an Egyptian child at Nagada. Marbles from Crete that date back to 2000-1705 B.C. are displayed in the British Museum. Marbles have also been found in ancient Native American earthen mounds in North America. During the reign of Elizabeth I, tradition has it that a game of marbles was played to win the hand of a maiden. The word "marble" was not used to represent the round toy ball made from various stones until 1694 in England. It was then that marble stone was being used for the toy and was being imported from Germany. Before this time, the English adopted the Dutch word "knikkers" for marbles. The word "knikker" was used by New York City children well into the 19th century. The earliest marbles were made of flint, stone, and baked clay. For centuries afterward, marbles were made of stone and sometimes real marble. Glass marbles were made in Venice, Italy, and later, around 1800, china and crockery marbles were introduced. A glassblower invented a tool called the "marble scissors" in 1846 that allowed a larger production of glass marbles. Clay marbles began being produced in large quantities around 1870. During the 1890s, the first machines to manufacture glass marbles were introduced. Martin F. Christensen invented the revolutionary glass marble-making machine in 1902, and his glass marble company produced over a million marbles each month. Horace Hill founded a company named the Akro Agate Company and moved it from Akron, Ohio, to Clarksburg, West Virginia, because natural gas and sand were more abundant in that area. By 1920, the Akro Agate Company was the largest marble producer in the world. Berry Pink of the Marble King Company helped promote local and national marbles tournaments in America during the 1920s and 1930s. The National Marbles Tournament is still held annually in Wildwood, New Jersey. Jeff Carskadden and Richard Gartley are recognized mibologists who have published the most scholarly works to date on the subject of toy marbles. Their research shows nine marble games that can be found on 17th- and 18th-century Dutch wall tiles. "Mib" is the Latin word for marbles; "ology" is Latin for "the study of." Marble games can be divided into two types: the games in which a player tries to knock his opponent's marbles with his own (and win the marbles), and the games in which a player tries to hit a target or roll the opponent's marble through a hoop or into a hole. There are specific ways to play marbles and to hold what is called the "shooter marble," which is a larger than the regular playing marbles. One method of shooting is called "knuckling"; and another way is called "fulking." One can also roll or flick the marble until these other two methods are learned. Marbles are definitely a part of America's heritage. They have been a popular American game from Colonial times to the present. Norman Rockwell painted a wonderful picture called "Marbles Champ," which features a little girl winning the marbles of two forlorn boys. 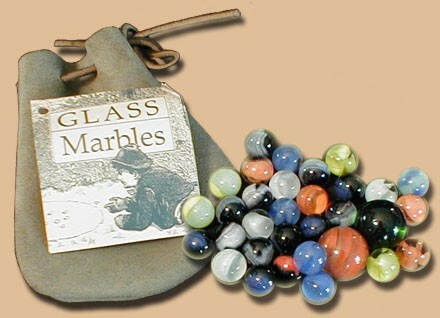 If you are interested in marbles, you can visit the Marble Museum in Yreka, California or online at www.marblemuseum.org. Nine Men Morris: A Morris was an English dance from the 17th century, and the game was apparently named after the dance. The game board consists of a flat, square board into which 24 holes have been drilled, all following a progressively larger pattern of three squares of eight holes which form three holes to a side. Two differently colored pins are used (twelve for each player). The object of the game is place your pins in such a way as to form a straight line of three of the same-color pins, while preventing your opponent from doing the same. The game was played in America as early as the mid-1700's, and continued to enjoy popularity through the time of the War Between the States. 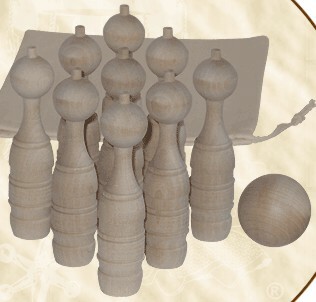 Ninepins has been a popular sport in North America since the Dutch settlers brought it with them to the Hudson River Valley in the 17th century. It is one of many forms of bowling games played in Europe since the time of the ancient Greeks and Romans. 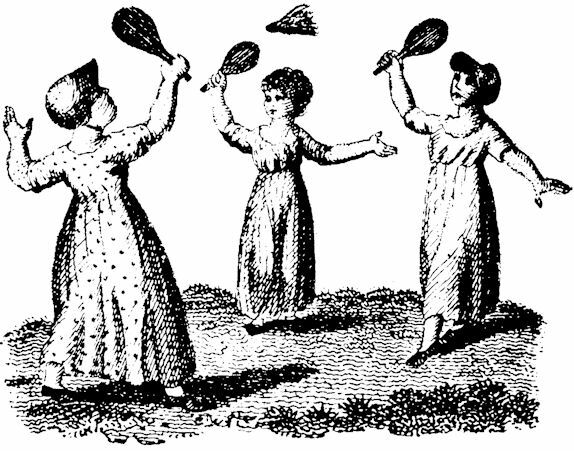 In colonial America men and women of all ages enjoyed the popular pastime of ninepins. For more information regarding Nine-Poins and Bowling Games, see the "Historical Background" below the shopping cart. Tabletop (CF) Ninepins Game This set of tabletop ninepins, meant for playing indoors, has been developed from accounts and pint sources provided by the Colonial Williamsburg Foundation and has been produced with their permission. Out solid wood ninepins stand 5" tall. They are packaged with 2 solid wood 2" balls in a box printed with history and instructions for play. Tabletop (HFT) Ninepins Game Our set of Nine Pins (with cloth bag) is a tabletop version of the traditional bowling game which can be played on any tabletop surface. It comes packaged with a cloth, drawstring bag, game rules, a unfinished 1 1/2" wooden ball, and an extra bowling pin for anyone who also cares to play Ten Pins. The pins are 3 1/2" tall solid wood and are basically a wooden clothespin by Historical Folk Toys. 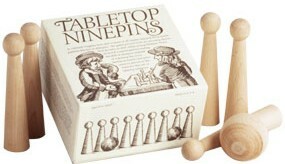 Toy Tabletop (HFT) Ninepins Game Faithfully reproduced from an 18th-century plantation's collection, the Replica Toy Nine Pins set are nine unfinished hardwood pins measuring 1 inch wide and 4-1/4 inches tall, plus a 1-1/2-inch unfinished wooden ball. 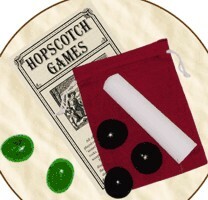 A quality, heavy-plain muslin bag with draw stings is included for storage of the set along with history and game rules by Historical Folk Toys. Great fun for children and adults alike. Historical Background: Bowling games are among the oldest games in the world. Archeologists have found stone bowling pins and balls buried with the mummified remains of a child in Egypt who died around 5000 B.C. Cavemen probably bowled at targets to increase their skills at hunting. Ula Maika, an ancient Polynesian game, was played with stone pins and balls. An ancient Roman version of this game became known as "boccie," which is an Italian form of what the British refer to as "lawn bowls." In 12th-century England, lawn bowling was a popular pastime. Indoor bowling began in German monasteries. The peasants who attended church always carried their big clubs called "kegels" with them. When they attended religious services, the monks had the peasants place their kegels at the end of a long narrow hallway. In order to be absolved of sin, the peasant would have to roll a round rock and knock down their club, which represented the Devil. If they missed, they would have to mend their ways and repent. The monks eventually made a fun game of this activity. The word "kegling" is still used today for bowling and "keglers" for bowlers. Eventually, rolling stones at kegels lost its religious significance and the wealthy adopted this game as a favorite pastime. Martin Luther, who translated the Bible into German during the 16th-century, was one such bowling enthusiast who encouraged a uniform set of rules. The game was officially called Kegelspiel or Nine-pins. Soon the game spread from Germany to Holland and the Dutch brought it with them when they settled in New Amsterdam (now New York City). The earliest Virginia colonists loved the game so much it interfered with their work. After Captain James Smith returned to Jamestown, bowling was declared illegal and punishable by up to three weeks in the stocks! During the early 1800s, Nine Pins was such a favorite game that it was played in many basements and back rooms of taverns. Heavy gambling and betting were associated with the game and soon it was outlawed. People, however, still enjoyed playing this game. So, to get around the new law, they added another pin and "ten pin bowling" was born. By 1895, the American Bowling Congress was formed and they established official rules and regulations. 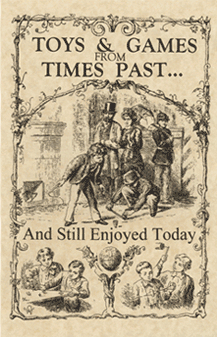 Tabletop games rose in popularity when playing on the floor of pubs and taverns was no longer feasible. Special tables were made for games such as Skittles, Carom, and Crokinole. The table game of Bagatelle (from the French word meaning "a trifle" or "small thing") was also a popular game in the 19th century. By 1920, Bagatelle evolved into the pinball machine. Fun Fact: By the 14th century, bowling was such a favorite gambling activity that King Edward III banned the game so it would not interfere with archery practice. The person who had just dropped the sticks began the game, removing one stick at a time and working through the pile to remove all of the sticks without causing any of the other sticks to move. The object of the game was to accumulate more sticks from the pile than the other players removed. In the event that any stick other than the one being removed was moved at all, that player forfeited his or her turn to the next person. At the end of the game, the player with the most sticks won. Pick-Up Sticks: Our Wooden Pick-Up Sticks are a cut above! These exclusive sticks are made with smooth-tapered, round tips. The Wooden Pick-Up Sticks package includes: 20 wood pickup sticks, a cloth drawstring bag, game rules, scoring system, and a concise history by Historical Folk Toys. Currently Unavailable, waiting for testing required by the government for toys. 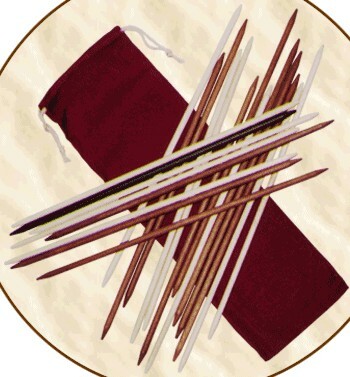 Junior Pick Up Sticks: These are Bamboo Pick-Up Sticks 7-1/8 inches long. There are 41 sticks, packaged in a wooden box with a sliding lid. Box size is approximately 7-1/2 inches long by 1-3/4 wide by 1 inch high. Instructions and history are included by Historical Folk Toys. Nine, ten, a big fat hen." 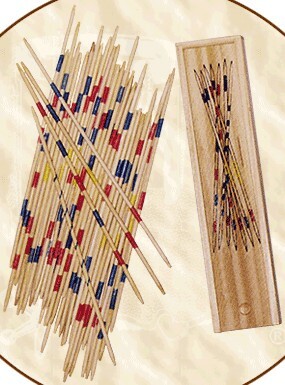 Before the Mikado version of pick-up sticks appeared in America, this game had spread from China to Korea and Japan. This game appears to have spread to the Haida Indians of British Columbia as well as the Lenape Native American tribe in California via the Bering Strait or by ship across the Pacific Ocean. Native Americans played this game with straws of wheat and taught it to the early English settlers in the American colonies. This became a popular parlor game for young people during the Colonial and Victorian eras and is still enjoyed by children today. Canadians refer to this game as "Spilikins," which is the name used by the British. A drawing of a set of intricately carved ivory spellicans (different spelling) is featured in R.C. Bell's book, "Board and Table Games from Many Civilizations." The British spellican sets, which feature carved bone or ivory, were imported from China. If you wish to make your own mini set of pick-up sticks, use 31 round toothpicks and paint different colored stripes on them to represent different points. 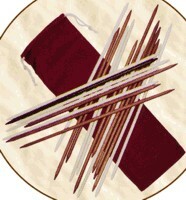 Make one stick a solid color or with just one stripe to represent the Mikado or "emperor stick." This stick can be used to assist picking up the other sticks after they are scattered or dropped. Keep score on paper and have some old-fashioned fun. The next time you play pick-up sticks, you will know that you are having fun just as children in ancient times did. Quoits, Table Top Version: Our tabletop version of Quoits is the classic American ring toss game. It is a skill game that is similar to horseshoes. 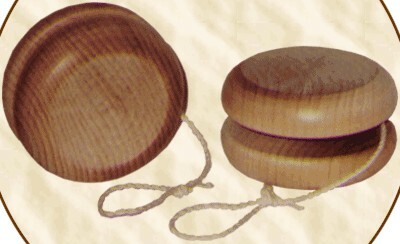 The stake or "hob" measures 3 inches by 3 inches by 3 inches and comes with two 2-3/4 inch diameter wooden rings and the game rules for traditional Quoits by Historical Folk Toys. Quoits was a popular parlor game. Historical Background: The game of quoits may have evolved from ancient Greece, where athletes enjoyed throwing a discus for competition. Peter Brown, president of the National Quoits Association, believes that the Greeks passed quoits to the Romans as a weapon of war. His theory continues with the thought that the Romans brought the game to Britain. He even suggests that the origins of the game go back to the Minoan Empire circa 2000 B.C. because the boy king of Knossos evidently used quoits as a weapon on slaves if they tried to escape. Quoits was made illegal in 1388 by Sporting Regulations, but by the 15th century, it had become a favorite organized sport in English pubs and taverns. The first official rules for the game of quoits were printed in the April, 1881, edition of The Field in northern England. The National Quoits Association was formed in 1986. There are several different games of quoits being played in England today: The Northern Game, The Long Game, East Anglian Quoits, and Sward or Lawn Quoits. Sward Quoits is played with a clay square to which the stake or hob is set in, but it can become muddy and difficult to maintain. Many people happily adapt this game and its rules for backyard play with the hob or stake set in the grass. Quoits was played during the American Revolutionary War by both British and Continental soldiers to pass the time. It has been said that the game of horseshoes was derived from quoits because some people could not afford to have quoits made, so they used what was similarly available: old horseshoes! Miniature versions of indoor quoits were played near the Welsh-English border for at least a century. It seems that the game was invented toward the end of the 19th century, but the history of indoor quoits is not really known. A game called Rings was played in Northern England. Now, many variations of the game exist. "Deck quoits" were made from rope and used on cruise ships. "Rope quoits" is probably the same game and is popular in Australia. English and Welsh descendants in parts of Pennsylvania play the game with the hob set at a slight angle on a slate board instead of a clay bed because they resided in "the slate belt." Is it because we didn't have one as a child? It's hardly possible to think of a more timeless, popular, exciting toy that spanned ages and classes. 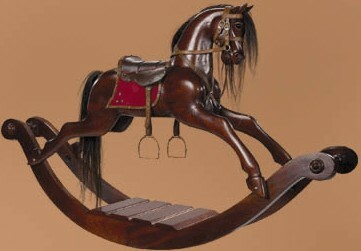 Today's rocking horses are hardly different from the ones Victorian children used to ride in their playrooms. Only now they're popular, if pricey, home decor and are regarded less as toys. Our supplier's children grew up with a pony-sized wooden horse made in Britain. The Medium and Large Rocking Horses are both made from solid mahogany and are expertly hand carved, hand-assembled and hand polished. Extreme attention and detail goes into the creation of each masterpiece. The saddles and bridles are made of leather. They have brass hardware, including the stirrups. They are both timeless pieces and a classic for any decor. 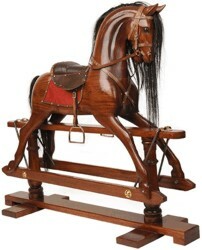 The large rocking horse is a swinging rocking horse and has a classic safety stand. 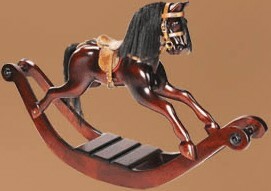 Small: Our petite rocking horse has all the same features as our larger masterpiece. Hand carved and just the right size for mantel, desk, or pedestal. Size is 75cm x 13.5cm x 46cm, 29.5" x 5.25" x 18". We do have one of these in out store. Can ship by U.S. Mail or UPS. Medium: Commanding presence with a size that fits pretty much everywhere. Iconic children's playroom classic, hand carved in rich polished mahogany, saddler's accoutrements, classic elegantly curved rockers. Size is 157cm x 31.5cm x 94cm, 61.75" x 12.5" x 37"". This item must be shipped by Truck, so shipping MAY vary from what the shopping cart shows. Large: In the classic British manner, hand sculpted in laminated and hand polished mahogany. Synonymous with quality and detail. Truly a work of art. This reproduction is in high demand. Each piece made to order and truly unique. Swing horse on classic safety stand. The safety rockers are chrome plated. Size is 143cm x 46cm x 120cm, 56.5" x 18" x 47.25". This item must be shipped by Truck, so shipping MAY vary from what the shopping cart shows. NOTE: These are hand made custom items and delivery time varies, Call for lead times. Children have been "rolling", "bowling" and "trundling" their hoops from the time of the ancient Egyptians through the hula hoop craze of the late 1950's. Artwork on ancient Greek vases illustrates hoops used in play as well as exercise. The early North American colonists brought this pastime with them from Europe, the hoops being made from whatever material was at hand. By Victorian times both wood and metal hoops were favorite playthings. The hoop can be trundled along, raced, used for skipping or twirling around the waist. 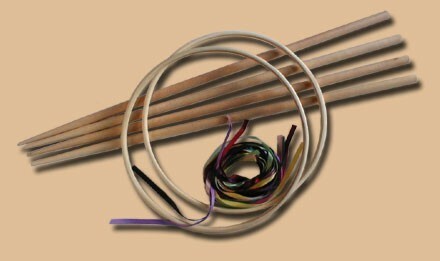 Our hoops are made of solid native hardwoods 28" in diameter x 1 1/2" wide and 1/4" thick. 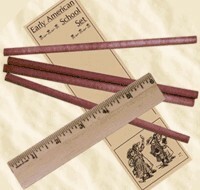 A dowel is included as a rolling stick, as well as a history card. This is an oversized item and requires an extra shipping charge. Because of this we have INCLUDED shipping in its price. Here is a table of prices, depending on how many you order. Rolling Hoop Toys will ship Fed-Ex Ground. That is because the Post Office has gone crazy. Priority Mail to the East Coast costs about $70.00! Just as today, every 19th Century (1800s) student needed supplies for school. Here is a selection of items that would be need by school children. 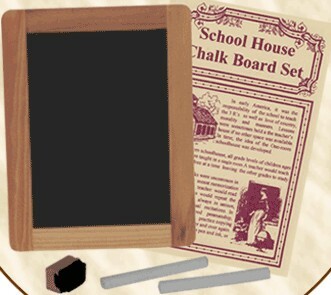 School House Chalk Board Set: Our Schoolhouse Chalkboard Set includes a 5-inch by 7-inch wood frame chalkboard, two sticks of chalk, and a booklet featuring eleven 19th-century popular schoolroom and childhood games. 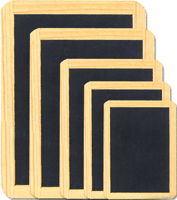 Our Chalkboard Set is great for car rides, party games or teaching children what it was like when students in one-room schools had to do their learning on slate chalkboards. 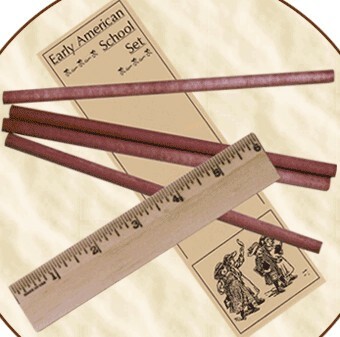 Early American School Set: Our Early American School Set includes a 6-inch wood ruler and four round, natural 7-inch cedar pencils without erasers like those imported from England to the colonies during the 18th century. 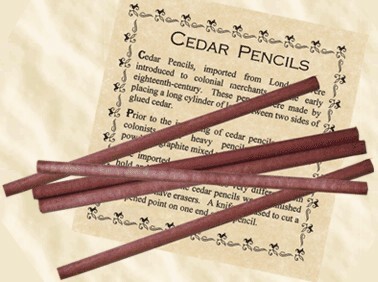 Cedar Pencils: Our Colonial Cedar Pencils are a set of five round, natural 7-inch cedar pencils without erasers similar to those used in England and imported to the American colonies during the 18th century. Pencils of this nature would have had to be sharpened by whittling or cutting one end with a knife. No pencil sharpeners for those colonists! Pencils are neatly wrapped in a parchment history	sheet. 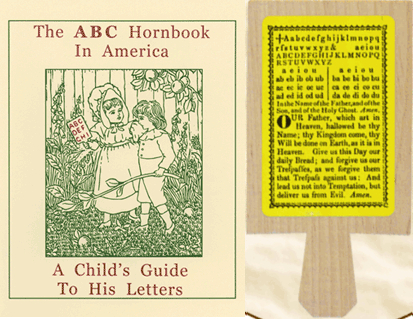 Childs (ABC) Hornbook: Our Child's Hornbook features an exact-size replica hornbook lesson sheet on a wooden paddle. 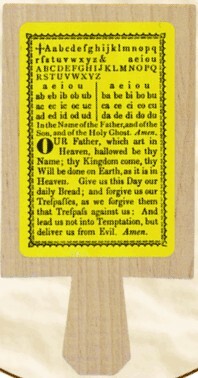 The typical lesson sheet on our hornbook includes the ABC's, vowel combinations and The Lord's Prayer. It is approximately 2-1/2 inches by 5 inches. 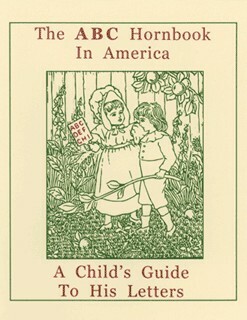 The Hornbook in America: ABC Hornbook in America is a cute book that contains the definition of a hornbook, a description of Colonial American schools, an explanation of what horn is, and how a hornbook was made. Also included is information about other learning tablets, the decline of the hornbook, and how the hornbook was used as a toy. Available at the back of the book is a hornbook to cut out. This publication is filled with nostalgic line drawings and more. Actual book size is 4-1/4 inches by 5-1/2 inches and contains 32 pages. 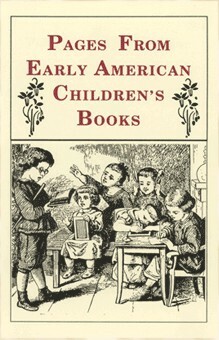 Pages from Early American Children's Books: Our Pages from Early American Children's Books contains excerpts from some of the earliest printed books for children between 1744 and 1837. It includes A Little Pretty Pocket-Book, Goody Two-Shoes, chapbooks, Elton's Pictorial A.B.C., a battledore book, Marmaduke Multiply, and Girl's Own Book. Actual book size is 5-1/2 inches by 8-1/2 inches and contains 32 pages. 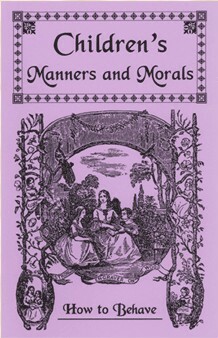 Manners and Morals: Our Children's Manners and Morals book includes moral maxims, how to behave, general rules and laws of etiquette, conversational etiquette, table manners, classroom rules, excerpts from books on morals and manners, the art of writing, proper pastimes, and other interesting information about expected behavior of children in the 1700 and 1800s. This best-selling book includes many nostalgic illustrations. Book size is 5-1/2 inches by 8-1/2 inches and contains 32 pages. Many more Toys, Games, Dolls, Musical Instruments, School Items. The whip top may be the most ancient member of the toy top family, thought to have originated in the Far East and making an appearance in manuscripts as early as the 14th century AD. At least 5 types of tops were known in England by the 16th century, including peg tops, whip tops and hand-spun tops. Toy tops brought to the new world colonies by European settlers would not have been the first tops on the North American continent, however. Tops of all kinds were very popular with North American Indian tribes, who often played their top games on the ice. 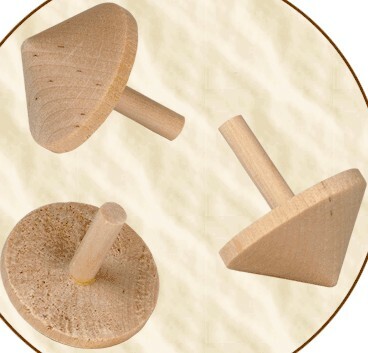 Peg Top (CF): Our peg top is the familiar "turnip shape" top set in motion by a wound string. In the interests of safety we have adapted the traditional "peg" from a long, sharp point to a rounded spinning top. Our solid wood top is decorated with burned lines, packaged with history and instructions in a poly bag. 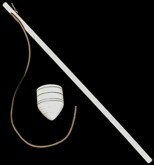 Whip Top: Whip tops are most often used in racing or endurance games. The top itself is tossed or twisted to start it spinning, whereupon it is lashed from the side with the whip to maintain the spin or drive it forward. The shape and size of out solid wood top is based on an 18th century engraving. The top is packaged in a poly bag with a whip consisting of a wood dowel with a rawhide lash attached. A history and instruction sheet is included. 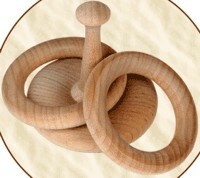 Finger Top: Reproduction of the 19th Century (1800s) wooden spinning top. It is spun by holding between your thumb and fore finger and then snapping your fingers. Instructions for two top games are included on a card that comes with each Finger Top. 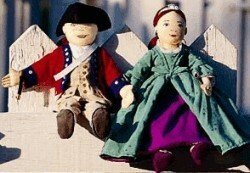 They come in a natural wood finish and are 1-3/4 inches tall and 1-1/2 inches in diameter by Historical Folk Toys. Historical Background of Tops: Spinning tops have been used by cultures throughout history and around the world. Tops were introduced in Japan during the 8th century from China by way of Koma in the Korean Peninsula. Japanese tops are known as "koma" and were originally a game for court people and nobility. Playing with tops is also part of our Early American history. 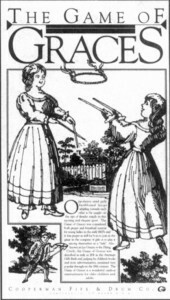 They were known as "peg tops" in the early 1800s and played with by boys. Historical Background of Finger Tops: This top is an authentic reproduction of an early 19th-century spinning, wooden top. Tops come in many different shapes and sizes and have various names like Peg Top, Humming Top, Whip Top, Spinning Top, and Finger Top. Some are used with string; others just have a long round stem like our Finger Top, for spinning between the thumb and first finger. This cute little top fits in your pocket and travels a long way to quiet a curious youngster on just about any flat surface. Play with two tops and see which top spins the longest. Simple whirling toys were mentioned in English literature as early as 1686, and would certainly have been as popular in early America as they were in Europe. Similar toys have also been found in Native American cliff ruins, indicating the toy's antiquity in North America. A folk toy that could have been easily made with materials at hand, one can imagine this toy amusing children from colonial times right through the westward migrations, and continuing to fascinate children today. Pewter Whirligig Whirling toys made of hammered lead musket balls or coins too old or thin to be of value have been excavated from early American towns, plantations, and military campsites. 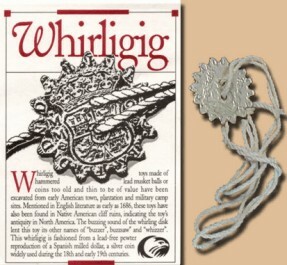 Our whirligig, packaged in a poly bag with a history and instruction insert, is fashioned from our lead-free pewter reproduction of a Spanish milled dollar, a silver coin widely used in North America during the 16th through early 19th centuries. Wood Whirligig / Buzz Saw The sound of the whirling disk lends this folk toy its common name of "buzzer", although it appears in English literature as early as 1686 under the general name for spinning toys, whirligig. The scalloped edge of our buzzer identifies it more particularly as a "buzz saw" toy. In past times the edge was often sharply cut into a sawtooth pattern, but a buzz saw with any shaped edge will produce an impressive loud, whizzing noise when it reaches full speed. Historical Background: The Buzz Saw is one of the most popular noisemakers of all times! Native Americans made "buzzers" from a circular piece of bone or antler and used sinew instead of string. Colonial children played with buzz saws. 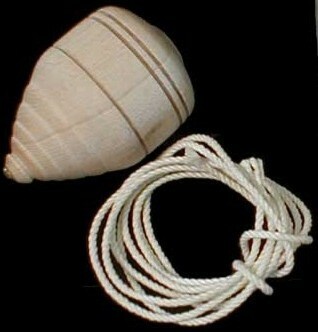 This type of noisemaker was also known as "button on a string" during the Victorian Period and later. A very large button from a mother's sewing basket could be strung for this toy. Coins, bamboo, stones, and seashells have also been used to make this toy. Tin was even used, and teeth were cut around the circumference so that the disc would shred a piece of paper when the two came in contact. Made this way, it resembles a circular saw blade, and this is where it got the name Buzz Saw. Other names for the Buzz Saw are Whizzer, Whiligig, Whirligig, Moonwinder, and Skyewinder. The term "Dummy gun" comes from the 18th century, when young militia recruits were given sticks or simply shaped, non-functioning wooden guns for practice in drilling and marching in formation. Each is provided with a hang tag with history. BROWN BESS FLINTLOCK WOOD DUMMY GUN This long gun, popularly known as the "Brown Bess", was a standard civilian flintlock musket used in 18th century America and the primary firearm used by both sides in the American Revolution. Later converted from flintlock to cap lock mechanisms, these old long guns continued to see use well into the 19th century. Our full-sized wood dummy gun is faithful to the silhouette and proportions of the historic firearm it represents. BLUNDERBUSS FLINTLOCK WOOD DUMMY GUN This short-barreled, large bore flintlock gun was known as a "blunderbuss" from the old Dutch words doner (thunder) and bus (gun). Its distinctive, widely flared muzzle was designed to scatter shot at close range, making it popular as a weapon of home defense. The blunderbuss, perhaps best known as the weapon of choice of buccaneers and pirates, was also adapted for use as a standard issue British Sea Service weapon (1790-1815); at sea, the gun was light enough to be shoulder fired but could also be rail-mounted for use as a swivel gun. Our full-sized wood dummy gun is faithful to the silhouette and proportions of the historic firearm it represents. CIVIL WAR HARPERS FERRY / SPRINGFIELD WOOD DUMMY GUN One of the standard U.S. regulation arms of the American Civil War period, this gun was formally known as the U.S. Rifle Musket 1855 Model. About 60,000 of these guns were issued by government arsenals in Harpers Ferry VA (1859-1861) and Springfield MA (1857-1861). These percussion muzzleloaders had rifled bores specifically designed to use Minie ball bullets, and would have been equipped with a bayonet. Our full-sized wood dummy gun is faithful to the silhouette and proportions of the historic firearm it represents. LEWIS & CLARK AIR RIFLE WOOD DUMMY GUN The air rifle used by Meriwether Lewis and William Clark during their 1803-1806 expedition to explore the Northwest used compressed air instead of the usual black powder to shoot a .31 caliber round. Manufactured by Isaiah Lukens, a clock and gun maker from Philadelphia, the rifle made little noise, did not smoke, and had a very slight kick when fired. Although used for hunting, the main purpose was to impress the Native Americans that Lewis & Clark would meet during their historic journey. Our full-sized wood dummy gun is faithful to the silhouette and proportions of the historic firearm it represents. WINCHESTER "THE GUN THAT WON THE WEST" WOOD DUMMY GUN The 1866 Winchester Carbine, a weapon popularized as The Gun That Won The West, was produced at Oliver Winchester's New Haven (CT) Arms Co. A short-barreled black powder rifle, the Winchester Carbine introduced the lever action slide-loading cartridge, and was a formidable weapon that could quickly shoot 10 bullets without reloading. Our full-sized wood dummy gun is faithful to the silhouette and proportions of the historic firearm it represents. NAVAL PISTOL / PIRATE PISTOL WOOD DUMMY GUN Common arms aboard military men-of-war ships as well as the fast-running sloops of the privateers throughout the 18th century, flintlock sea service pistols were characterized by their belt hooks and long barrels. The notorious pirate Blackbeard was known to have carried three or more such pistols belted across his chest. Our full-sized wood dummy gun is faithful to the silhouette and proportions of the historic firearm it represents. SHORT SWORD WOOD DUMMY SWORD Short swords were favored in the North American colonies from early times by soldiers, sailors, and hunters alike, particularly from the 16th to the 18th centuries. Sometimes referred to as a cutlass or hanger, this weapon was light in weight, typically had a single cutting edge on a curved or straight blade, and was suitable for close combat and defense as well as for the hunt. The short sword could be quite simple or very elaborate in material and design, depending upon the wealth and significance of its owner. Our solid pine short sword has a dowel-pinned crossguard (no nails) and is provided with a hang tag with history and terminology of the sword. The Yo-Yo date back more than 3,000 years. Ancient Stone Yo-Yo have been found in Greece. It became popular with the French Court in the 1700s and was called Jou-Jou. It became popular with English children of the 1800s. In the United State many patents for Yo-Yo improvements were applied for before, during and after the Civil War. 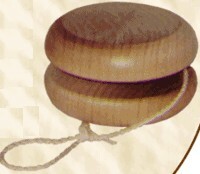 The Yo-Yo was also known as the Bandelure and the Prince of Wales Toy. Natural Wood Yo-Yo: Our Sleeper Yo-Yo package includes a natural wooden yo-yo, directions for five fun sleeper yo-yo tricks, and a brief history by Historical Folk Toys. There is always a new generation of kids that want to learn how to yo-yo. Historical Background: The yo-yo dates back to ancient Greece and was used in England, France, and other European countries. It was also known as a "Bandelure" or winding toy and in England a "Prince of Wales" toy. Today, most yo-yos are made from either wood or plastic, but they have also been made from gold, silver, and animal horn. Item and Material Price Complete Music for Fife and Drum by Walter D. Sweet: A collection of 78 tunes containing some Civil War selections as well as many other traditional favorites. Each arrangement features harmony, style marks and guitar chords. The music is supplemented with histories of the tunes and drumbeats. 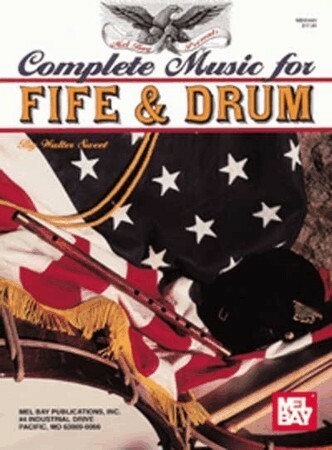 Complete Music for Fife and Drum was compiled by a professional fifer and is intended for the military fife in B-flat. This book offers tunes from the Revolutionary and Civil War eras with suggested snare and bass drum parts as well as chord progressions. It also contains a wealth of fife history and resources. with an instruction sheet, music and history. Old Pitch Fife with an instruction sheet, music and history. More toys and games will be added, as we can. Our reproduction items are more than just looks-like, they are authentic replicas made as closely as possible to the original item. They are carefully manufactured using materials that match as closely as possible to the original items. We use patterns made from original items; patterns that are modified to be historical not only in look, but construction; or patterns that we have made from drawings, pictures or paintings. Many of our items have been purchased by museums (well known and not so well known) for display and/or for use by docents and historical interpreters. Clothing and Uniforms Most of our men's replica clothing and uniforms are made for us by the Quartermaster Shop, although some items are manufactured by us or elsewhere. The ladies and childrens attire is mostly made by us. Almost any style of clothing that was worn in the United States during the 19th Century (1800s) (starting from the 1820's on, including Victorian, Edwardian, American Civil War, Indian Wars. Old West and Spanish American War (Span-Am)) is available. Other Items (accessories, accouterments, camp equipment, leathergoods, tents, tinware, etc.) are mostly purchased from other makers, although some are made by us. In many cases we have mutiple suppliers of items, to assure the we can always have them available. We currently offer Clothing and Military Uniforms from the 1830s through 1900; which includes the Federal Era, Jacksonian Era, Dickens, the (Victorian Era (Mexican War, Antebellum, American Civil War (Confederate / CS / CSA & Union / US / USA), Indian Wars, Old West and Spanish American War (Span-Am War)). Our reproduction Victorian, American Civil War (US / Union, CS / Confederate), Indian War, Old West and Edwardian uniforms, civilian clothing (wardrobe) and equipment (accouterments, saddles and tack, camps equipment, etc) has been seen in historical films and period pieces, such as: Glory; North and South, Book II; Back to the Future III; Far and Away, etc. And in television projects, such as: Ironclads, Geronimo (TNT), Buffalo Soldiers, Blind Justice, Los Locos, Young Riders and others. Theatre companies also use our items for stage productions, while schools, teachers and museums use them as learning aids. Leavey Foundation for Historic Preservation, Inc.
Our forte is the 19th Century (1800s) United States History covering the period 1820-1920. Including: Victorian, Edwardian, Mexican War, American Civil War (Confederate / CS / CSA and Union / US / USA), Indian Wars, Old West & Spanish-American (Span-Am) War. We are involved in both historic preservation and education. We hope teachers, students, historians & researchers will find these pages useful, as well as reenactors & production companies. Uniforms of Gen. Robert E. Lee C.S.A. Uniforms of Gen. JEB Stuart C.S.A. Uniforms of Gen. Stonewall Jackson C.S.A. Uniform of Gen. Joseph Eggleston Johnston C.S.A.